Phở is a Vietnamese noodle soup consisting of broth, linguine-shaped rice noodles, a few herbs, and meat. We love the vegan versions, with tofu, tempeh or veggie meats. We used to call it Faux Pho, pronouncing “Pho” like “fo” as in the word “go”. Then we learned it is pronouced more like “fah” or “fuh” or something in between. However it is pronounced, the vegan version is delicious, cozy and warming on a cold night. Bring the vegetable stock to a boil. Add all of the chopped vegetables except the bok choy. For the spice mix— if using whole spices, wrap all of them in cheese cloth. Tie the spice bundle with kitchen string and drop it in the stock before adding the vegetables. If using dried spices, add them to the simmering stock. Cook the soup for an hour or until the vegetables are tender. Remove the spice bag if using whole spices. Add the bok choy and simmer an additional 10 minutes. Follow the package instructions for preparing mung bean vermicelli (or noodle of choice). Evenly distribute the mung bean vermicelli and/or cooked noodles at the bottom of a large soup bowl. Pour the hot soup over the noodles. 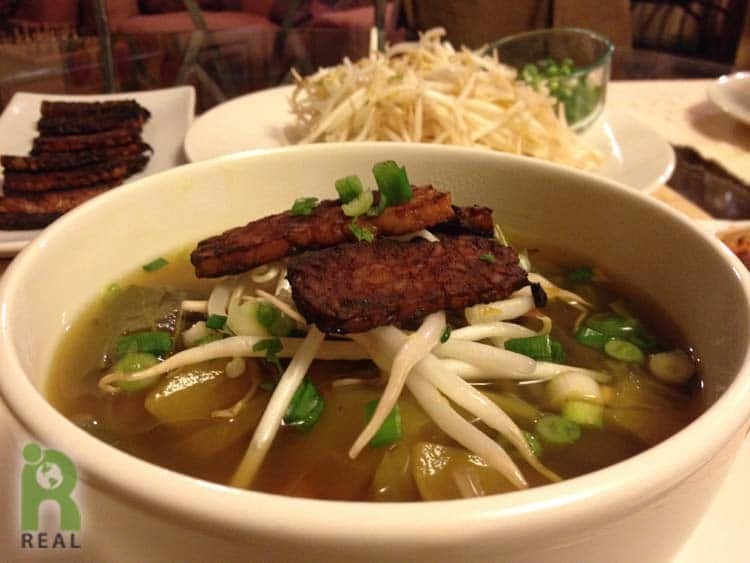 Pho may be garnished with tempeh bacon slices, bean sprouts, sliced jalapeno peppers, whole mint leaves and/or veggie meats and raw vegetables of your choice. Also try some of our sriracha sauce.